The country will hold parliamentary elections early to strengthen its resilience to the global economic crisis. As we settle into 2016, the world faces an uncertain future. Economic instability has escalated geopolitical tensions and an increase in extremism has led to migratory pressures that are now dictating the global political agenda. In Kazakhstan, falling commodity prices and external factors such as the sanctions on Russia and falling demand from China have had a negative effect on our economy. It is no secret that the upcoming year will be a challenge. Strong leadership and a clear strategy will be essential for our nation to overcome the current economic climate. It is for this reason that President Nursultan Nazarbayev approved a parliamentary initiative to dissolve the lower house and call an early parliamentary election. A new parliament and a new government, with a strong mandate to continue down the path of change we have already started, will be able to implement the measures needed to navigate our country back to prosperity. Backed by our people, they will be able to provide the stability necessary for reforms to flourish. Kazakhstan has overcome economic headwinds such as these before and there is no doubt in my mind that we can do so again. The reforms we have enacted are designed to diversify our economy away from an over-reliance on hydro-carbons and towards a mixed industry landscape. A strong and stable economy has been a key priority for our President and the “Nurly Zhol” (Path to the Future) New Economic Policy has already started investing $9 billion in public spending over three years, mainly in infrastructure development, which will create thousands of new jobs in our country. More than ever we are looking to engage with an increasingly globalized world and thanks to projects like the New Silk Road initiative our country is placed to take its place at the core of global trade. We recognize the need to let our population decide on who they believe should guide Kazakhstan back towards the success we have worked so hard to achieve. As such, we are committed to ensuring that the election will be open, transparent and fair. We are inviting international observers from the OSCE, CIS, SCO and other organizations to monitor the campaign and electoral process across the country. Election authorities will thoroughly investigate any suspected violations that are brought to our attention and we will make sure that once again the international observers can say with confidence that all election preparations have been effectively administered so voting can proceed freely. The election also serves to remind us of the progress we have achieved in our short history, as we celebrate our 25th anniversary of independence this year. On voting day, citizens from the multitude of faiths and backgrounds that make up our rich society will come together to choose new representatives. It can be tempting to view Kazakhstan’s democratic progress through the critical lens of established nation states with centuries-old traditions of pluralistic societies, but the speed of our transition, from a totalitarian to democratic nation shows our commitment to change and reform. We are proud of what we have achieved and we will always strive to improve where we can. These elections, and the opportunity they provide to our citizens to debate how we face and overcome our challenges, are incredibly important and we look forward to hearing the voice of our people. 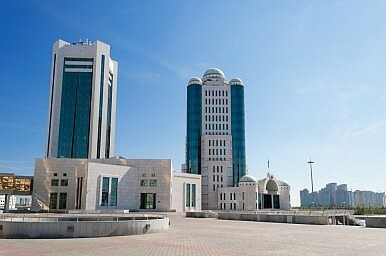 The Real Cause of the 21st CenturyUnderstanding Kazakhstan’s Politics, AgainUnderstanding Kazakhstan’s PoliticsKazakhstan’s Economic OutreachSnap Presidential Elections Called in Kazakhstan. But Why?